My Handsome, Lovable Little Terror! Boo's!!! story is filled with excitement, love, loss, and heartache, with a dash of adventure, action, and crime fighting! You'll laugh! You'll cry! You'll fall in love! It'll keep you on the edge of your seat! OK, OK. Maybe that's a bit much but you always have to start off any story with a great intro. One that grabs your attention. Don't you? Let's get down to Boo's!!! story. Once upon a time I had this stray cat hanging around the house that I nicknamed Brownie. She was a really beautiful cat. I tried my very best to try to bring her closer to me but all my efforts failed. She was just too scared of a really ugly guy like me. It just so happens that my garage door was broken - it had a really small entry way in it so she could comfortably squeeze in. And I, being a nice guy, made a small place for her to stay. A few months had passed when all of a sudden I saw this little white fur ball living in there too. He was really tiny and so cute but I didn't want to disturb him 'cause I didn't know how the mother would react. So I let them be. Well one day out of the blue I saw Brownie crawling around my front lawn. I don't know what happened to her but she couldn't walk. I was heartbroken and tried to help her but she didn't want my help. She hissed and tried to bite me while at the same time meowed and meowed and meowed. I had no other choice but to call animal control so they could pick her up. I was really sad that I couldn't help her. Once they got her I went into the garage in search of the kitten (I named him Boo!!! 'cause he's white like a ghost who sneaks up on you and goes Boo!!!) and any others she may have had. But I only found Boo!!! I picked him up and brought him inside, gave him a name and had a little ceremony for his new position of knight and protector of the household. So Boo!!! became Sir Boo!!! the Great. He warmed up to me really quick. Day one he spent hiding from me. I would find him and pet him but then he would run off again to hide. 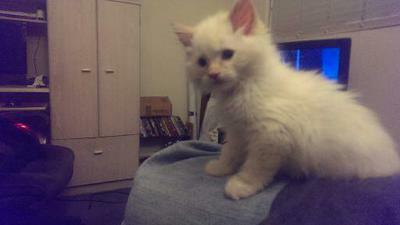 I took him to the vet on day two and found out he was a flame point, about 6-8 weeks old, weighing one pound. He had an eye infection but the vet gave me some drops to clear it up. My first impression of him was that he is really intelligent and not shy. Day one, I bought all the cat essentials including kitty litter. I stuck him in the box and he went potty as I expected, and he has been using it ever since. I haven't had one accident yet. He knows when it is time to play and when it is not. As an example, he never bugs me when I sleep. I'll lay down and he'll jump up beside me - he either shoves his face in my face or bites on a finger, then realizes I'm asleep so he just jumps off and plays with his toys. When he is tired he jumps on the bed and sleeps next to me. And as I am typing this he is just sitting there by my feet. I know once I'm off he'll start playing with me. For the time being, since he is so tiny, I carry him when I go to the store or the vet and he just snuggles right in with no fuss and hangs out. Not even spooked at the other cats or dogs at the vet or even at the store. Stays real calm. The other day I took him to get his shots and he was just sitting there in my arms with out any worries. Then all of a sudden a pug bumps into me and Boo!!! just started growling at him. Boo!!! didn't attack, thankfully (and I told him he was lucky) but he just wanted to protect me. He is my little guard kitty and earned his worth as a true knight. Everyone at the vet office simply loves him. They all say he is the calmest cat they have seen. He doesn't fuss during a check-up or when he is getting his shots, but I always tell them that he is way different at home! I've had Boo!!! for more than a month now and he is always by my side. As of today he weighs 2lbs 8oz. Although (and I know he is just a kitten) he likes to play more than he likes being held and loved. I would hold him on my lap but he just likes to run off and play. The only real time I get to hold and pet him is when he is dead tired and then he'll either sit next to me or on my lap or I have to go and pick him up. Sometimes I'll just pick him up when he is playing but I remain standing so he won't fuss. 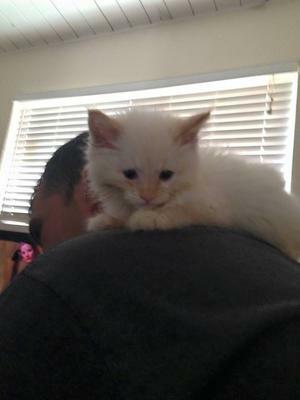 He also likes to think I'm a tree and he'll climb all the way up to my shoulders and stand there calmly. He is the terror of my life but I wouldn't want it any other way. I love my Boo!!! Javier, thanks so much for your story. Sir Boo!!! looks like a wonderful kitten and I'm pleased he's settled in well with you. I was so sad to hear about Brownie but it's difficult sometimes to turn stray or feral cats into house cats, and the outdoor life does take it's toll. With kittens, though, it's a different story if they grow up with humans around them, they can become very loving companions and Boo!!! is a very lucky kitty to have found you. I hope he has a long and happy life. 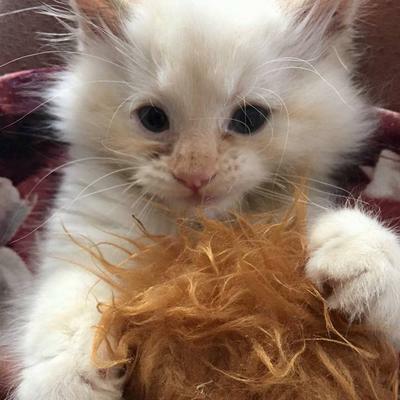 Incidentally, you might be interested to know that we had a similar story about another flame point Boo, also from California, and named for similar reasons! 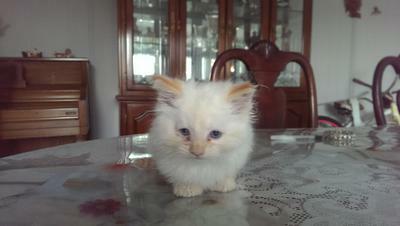 See the link 'Is My Boy a Flame point?' below. Comments for My Handsome, Lovable Little Terror! are taking care of one another. So sorry you couldn't help Brownie but you tried and taking care of the baby is so wonderful. Best of luck & I wish you many happy years together. Your Sir Boo!! is just adorable. I'm so glad he adopted you! Your Boo!!! man sounds delightful! It is a joy to read such a sweet, heartfelt story about you and him. I wish Boo!!! and you a long life together.